Volkswagen will, during the course of the model year, replace the Passat’s standard 2.5-liter 5-cylinder engine with a new, more fuel-efficient, turbocharged 1.8-liter 4-cylinder that makes just as much horsepower combined with more torque across a much broader portion of the engine’s rev range. As this new engine rolls out, starting with the SEL trim level, the Passat will switch from hydraulic to electric steering. Additionally, all models except the base Passat S come with Volkswagen’s new Car-Net telematics system and a Media Device Interface cable; the Wolfsburg Edition gains upgraded interior trim; the Passat SE, SEL, and new Sport trim levels gain a standard reversing camera; and the SE versions are offered with 2-tone seating, passive entry and push-button starting, and 18-inch aluminum wheels. Volkswagen has also reduced its Carefree Maintenance plan to two years or 24,000 miles. When the new Passat Sport model arrives, it will include 19-inch wheels, black mirrors, a black roof, a rear spoiler, 2-tone seats, paddle shifters, and special interior trim. 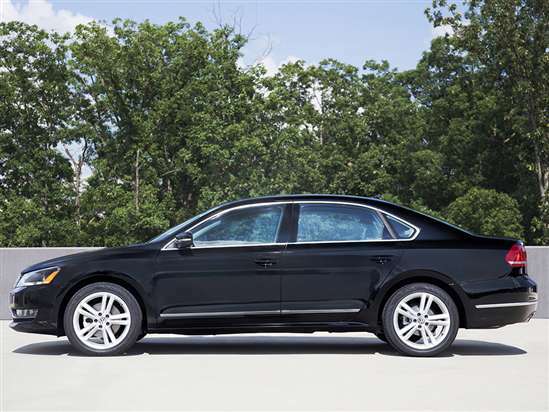 For 2014, the Volkswagen Passat is offered in S, Wolfsburg Edition, SE, Sport, and SEL trim levels. Upgrades from S trim, depending on the model selected, include aluminum wheels, leather seats, automatic climate control, an in-dash touchscreen display, a reversing camera, a premium sound system, a navigation system, a power sunroof, keyless passive entry with push-button starting, and more. All models include free scheduled maintenance for two years or 24,000 miles. Volkswagen is phasing out the Passat’s standard 170-horsepower, 2.5-liter 5-cylinder engine in favor of a turbocharged 1.8-liter 4-cylinder engine that makes the same horsepower and more torque while returning better fuel economy. A 5-speed manual gearbox is standard with a 6-speed automatic available. The turbocharged 2.0-liter diesel engine returns for 2014, installed in the Passat TDI and good for 140 horsepower and 236 lb.-ft. of torque, the latter figure delivering decent acceleration for the fuel-efficient engine. A traditional 6-speed manual gearbox is standard, with a 6-speed Direct Shift Gearbox (DSG) automated manual transmission available as an option. A 3.6-liter V-6 engine is optional, delivering 280 horsepower to the Passat’s front wheels through a 6-speed DSG. The EPA says the Passat’s 2.5-liter 5-cylinder engine gets between 25 mpg and 26 mpg in combined driving, depending on transmission selection. The new 1.8-liter turbocharged engine is rated at 28 mpg with either transmission, while the optional V-6 is expected to return 23 mpg. The Passat TDI turbo-diesel models are the most fuel efficient, rated to get 35 mpg with the manual transmission and 34 mpg with the DSG. Car-Net is Volkswagen’s new telematics system. Included as standard equipment for most 2014 Passat models, Car-Net includes Automatic Crash Notification, Speed and Boundary Alert settings, remote vehicle access features, and more.